As a restaurant patron, what do you find as most important? For me, it’s consistency. If a restaurant is a 10 – 99% of the time, everyone is happy. 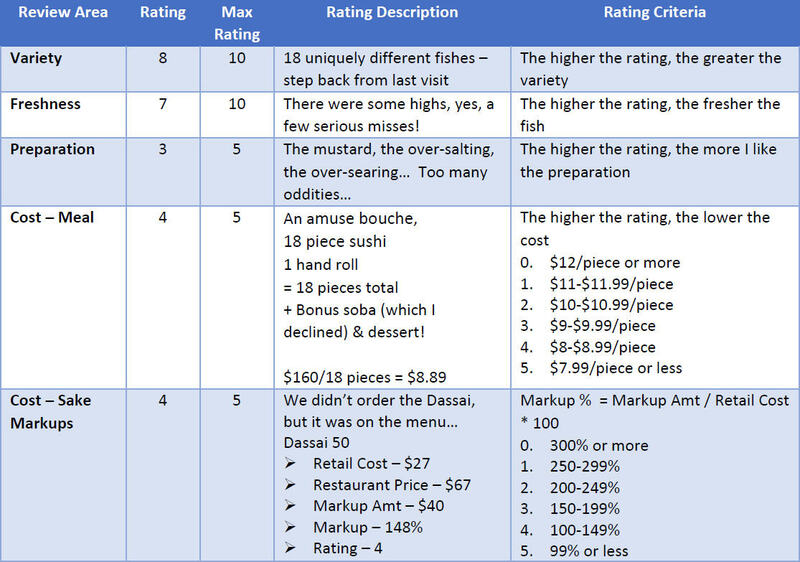 If a restaurant is a 10 – 80% of the time, but a 9 – 20% of the time, is that good enough? If a restaurant is a 10 – 80% of the time, but a 5 – 20% of the time, is that okay? Not if it’s omakase! Here’s the deal. 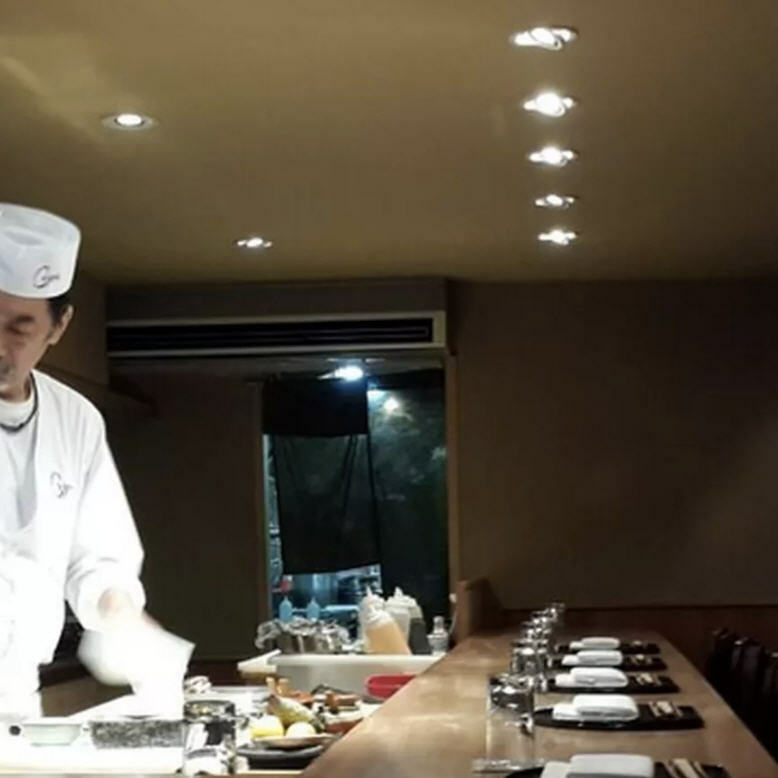 An average omakase dinner for 2 is roughly $300 alone, add 2 bottles of sake, another $300. 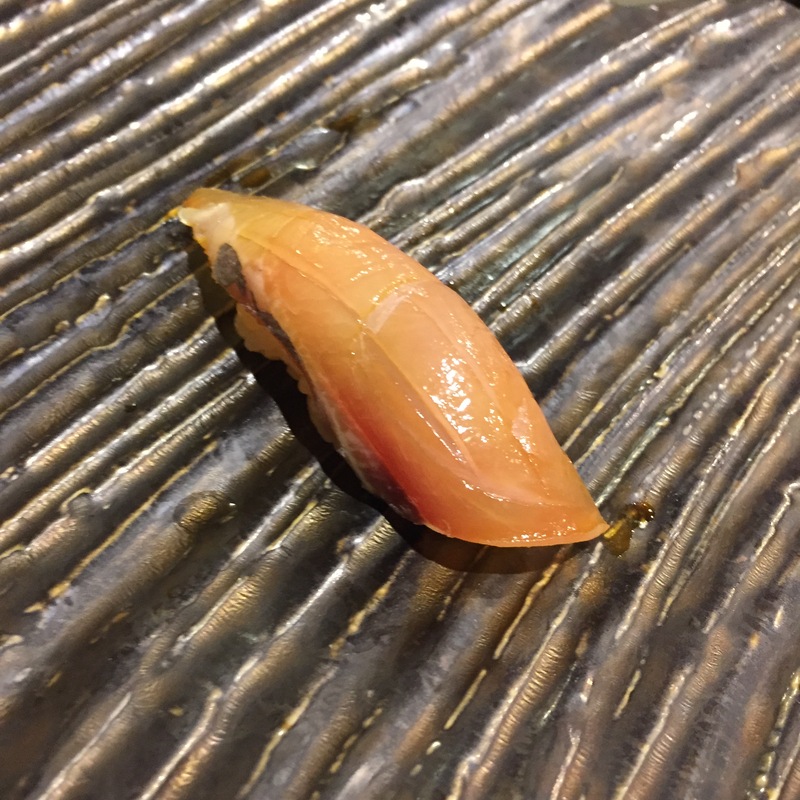 So if you’re going out for omakase, you’re expecting at minimum, a $600 tab for two, and that’s BEFORE tax and tip. Are you ok paying over $700 for two if it’s going to be a 5? I’m not! Equate my score to a 1-10 scale, and Cagen is a 6, a 9, and a 7. Our overall bill tonight came to $648.90 pre tip. With a $130 tip, $748.90 total. Now, would you be OK paying $750 for a 7 meal??? For this reason, it’ll probably be a while before our next return. Does anything look amiss to you? We were the first to be seated (we always are, as we tend to show up 15 minutes early every time), and we immediately noticed something was different. 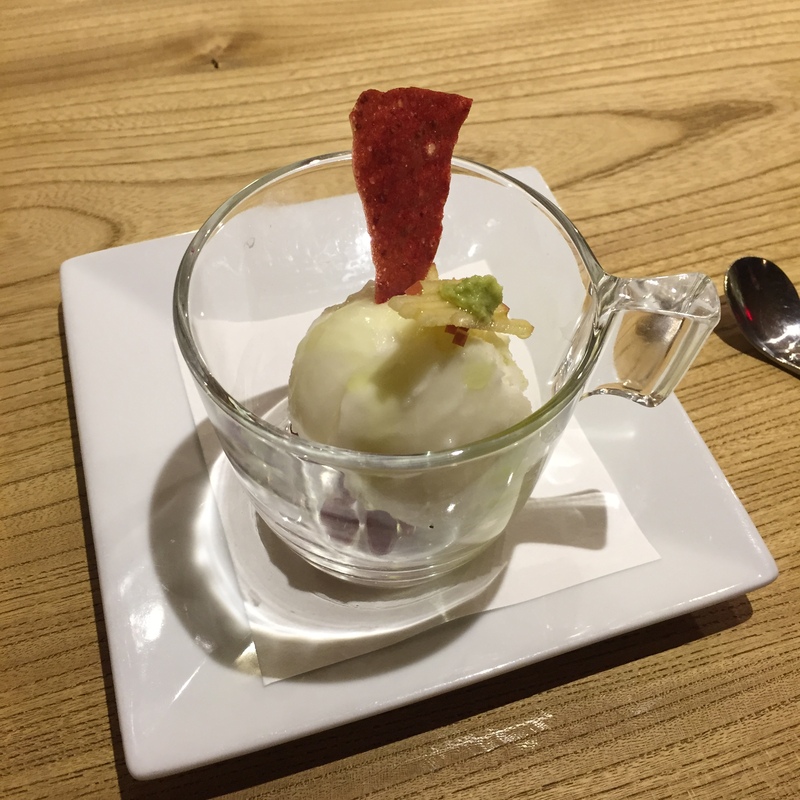 Now take a look at this second photo (from yelp). This was the “before” photo. 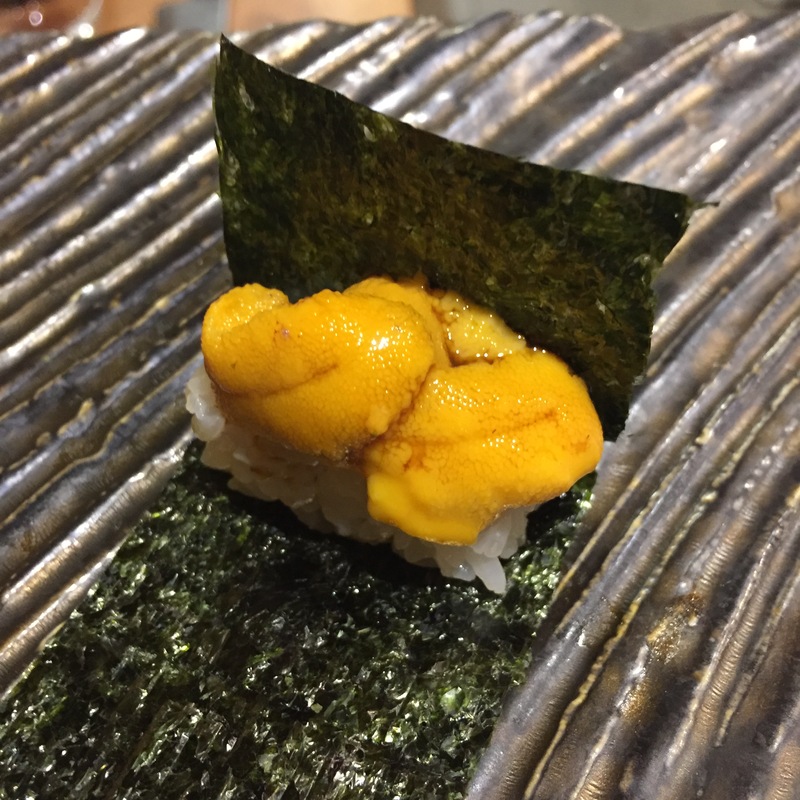 UNI from Mexico – Served with a “special seaweed”. I honestly don’t see how this seaweed was any different, anything “special”. The UNI itself was not good… It is a very different UNI, not a skunk, but also not sweet, not nutty, not the usual brine. Odd. I would not have ordered this had I had a taste upfront. 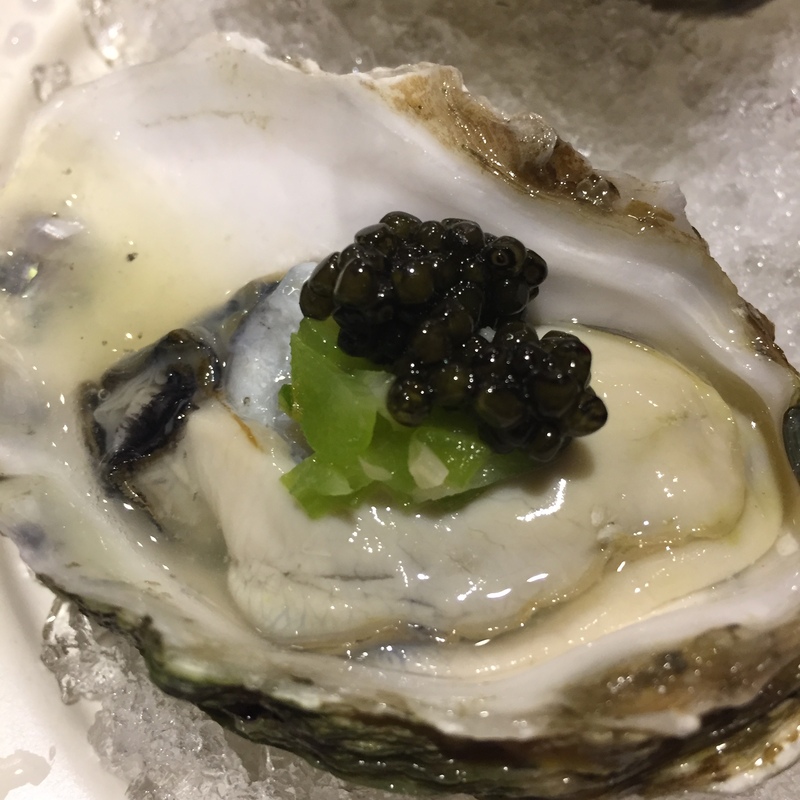 Kumamoto Oysters – Served with caviar, and an apple mignonette sauce. 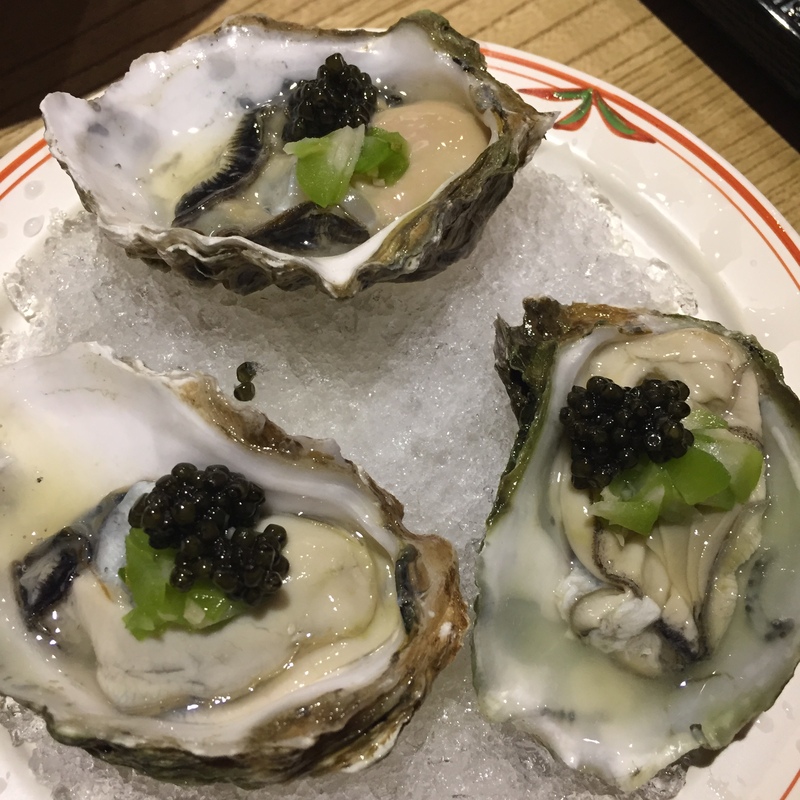 Loved the combo, and loved that Tomita-san did not skimp on the caviar. The oysters themselves were good, but definitely on the small side. 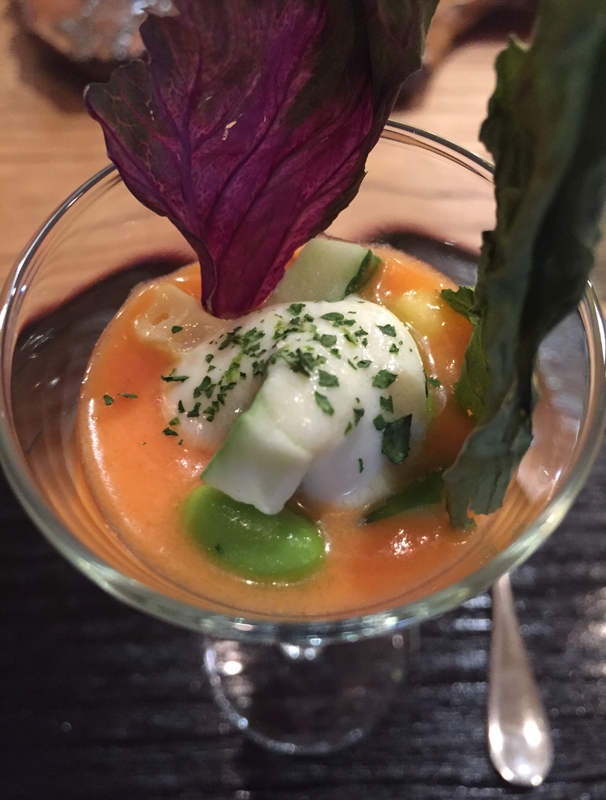 Amuse bouche: (photo is from an older post) Gazpacho of chia seeds, corn, edamame, white fish tofu purée, and dried cilantro. This was served during our last two visits too. Haven’t been a fan, today I remain uninterested. 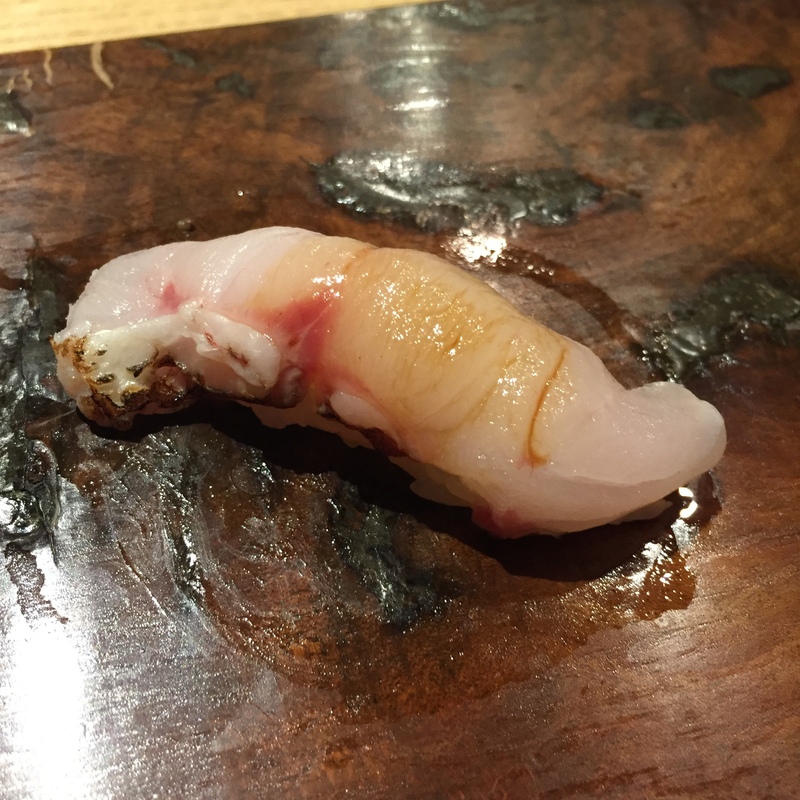 HE DAI – No idea what the origin of this fish is, but it taste just like a MADAI. Delish! MEDAI (Seabream/Butterfish) – Very good, very buttery. 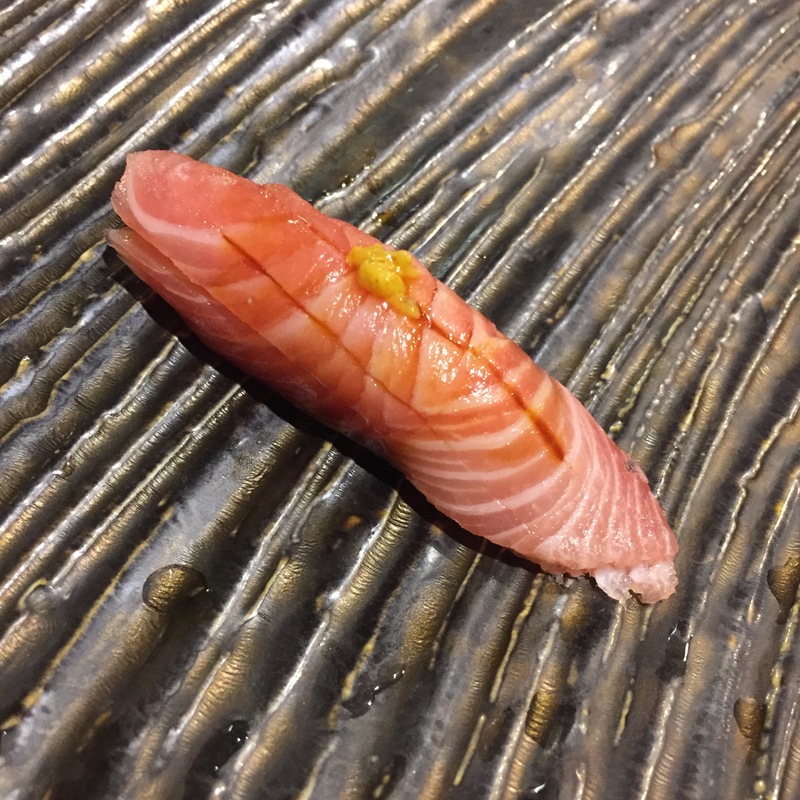 I once had the MEDAI and the MADAI side by side at KANOYAMA. That was quite a treat. When not having side by side, it is easy to mistaken one for the other. Or easy for chef’s to claim all seabreams as MADAIs, the fanciest AND costliest of the seabreams. 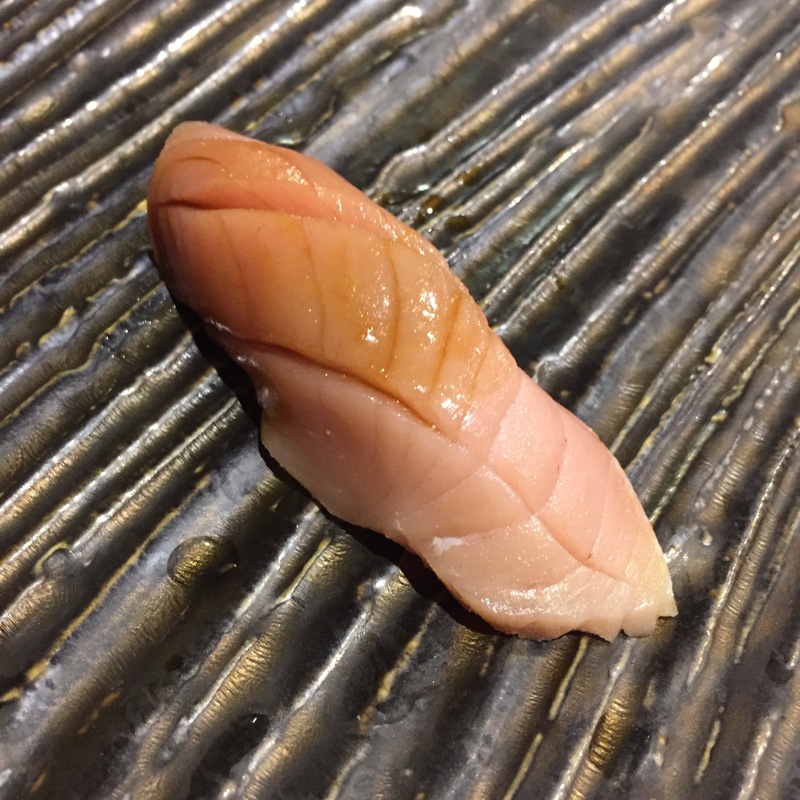 I appreciate that Tomita-san properly presented this fish for what it is. 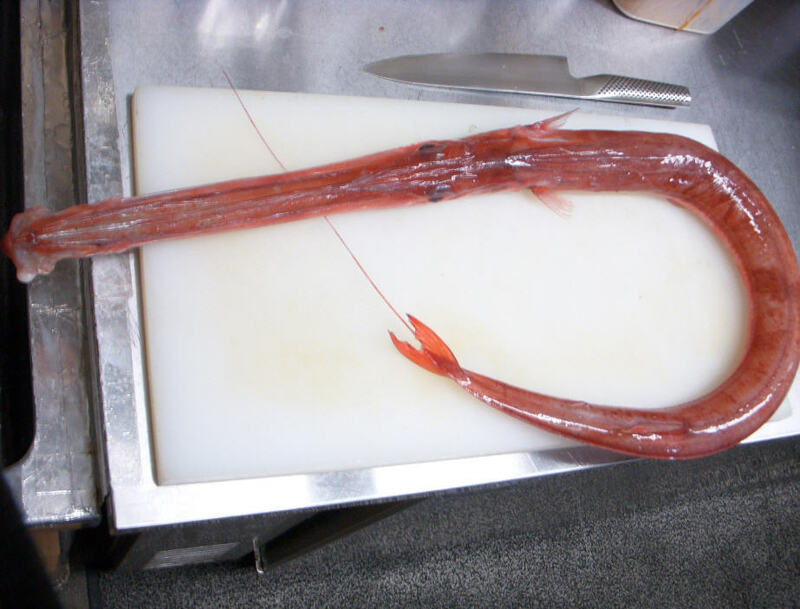 AKA YAGARA (Red cornet fish, Red trumpet fish) – Great crunch but not much flavor. As I’ve said in my July post, this fish was much more exciting to look at (whole), rather than to eat. 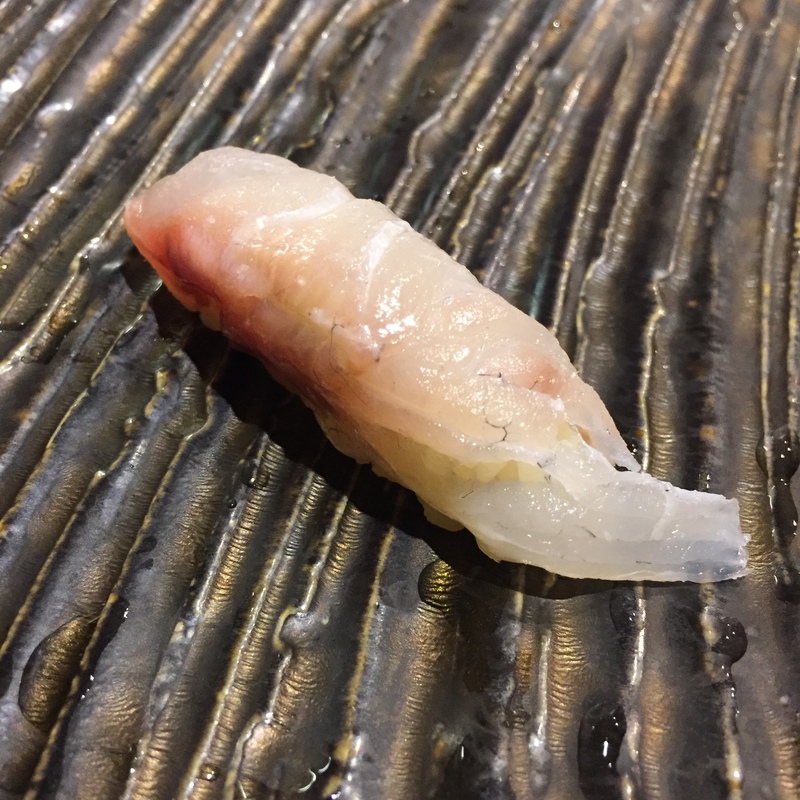 ISHIDAI (Barred Knifejaw ; Striped beakfish) – Surprising to see such a thick skin left on the fish. 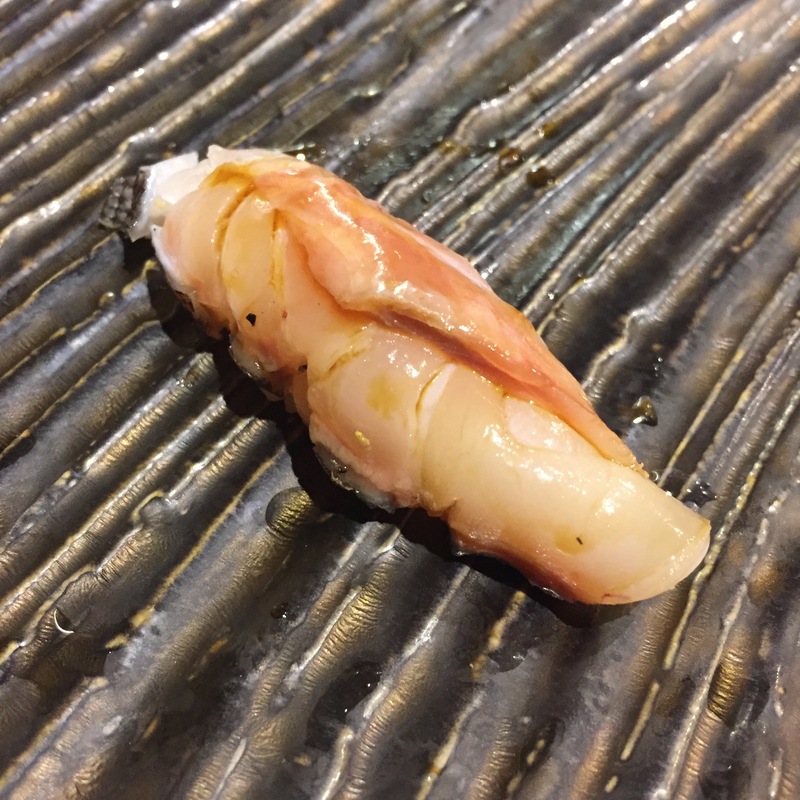 Tomita-san still managed to sear this skin to a crunchy, crispiness. That combined with the layer of fat immediately beneath, it was both crunchy and chewy. Very nice. KATSUO (Bonito) – Served with crispy garlic chips between the fish and rice. To be honest, this was beyond a subpar KATSUO, the crispy garlic chips is what made it bearable. 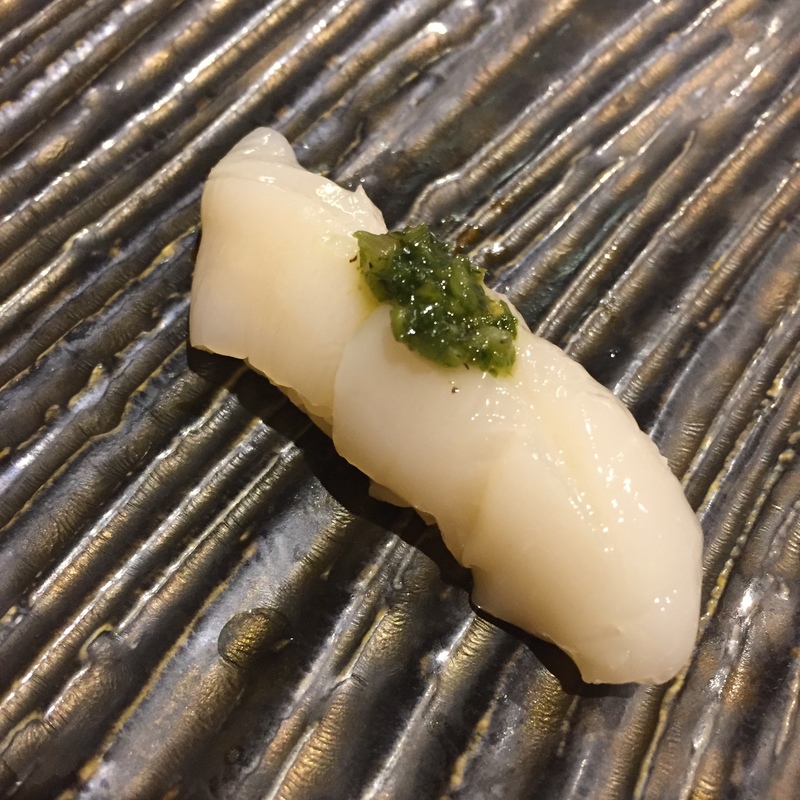 HOTATE (Scallop) from Hokkaido – Not as bad as the KATSUO, but not good either. 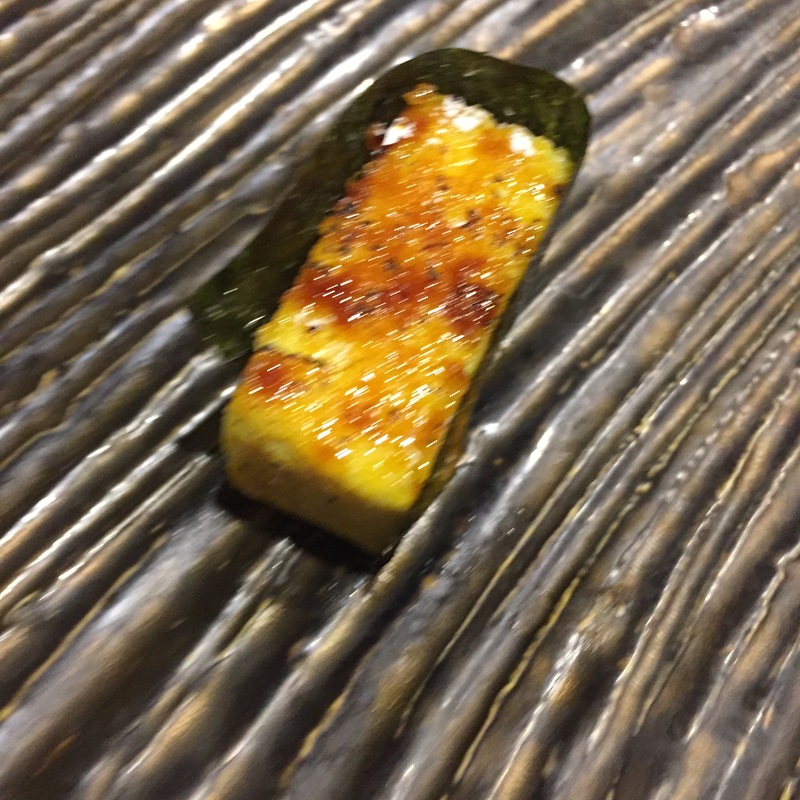 The HOTATE alone was mild, tasteless, and not at all crunchy. The wasabi and onion pesto saved it though. 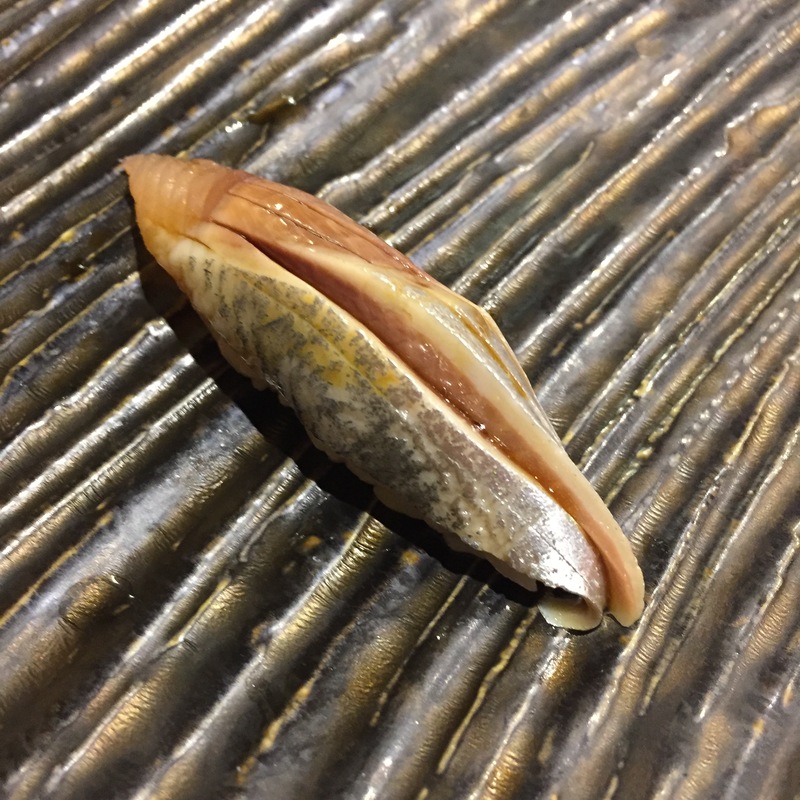 IWASHI (Japanese Sardine) – Amazing! Incredible really! I really should have asked Tomita-san. He used to put the chopped ginger and scallions atop, but today, he sandwiched it between the fish and the rice, just as he did the KATSUO. I wonder if there is a reason for serving it one way versus the other? Again, really incredible fish. 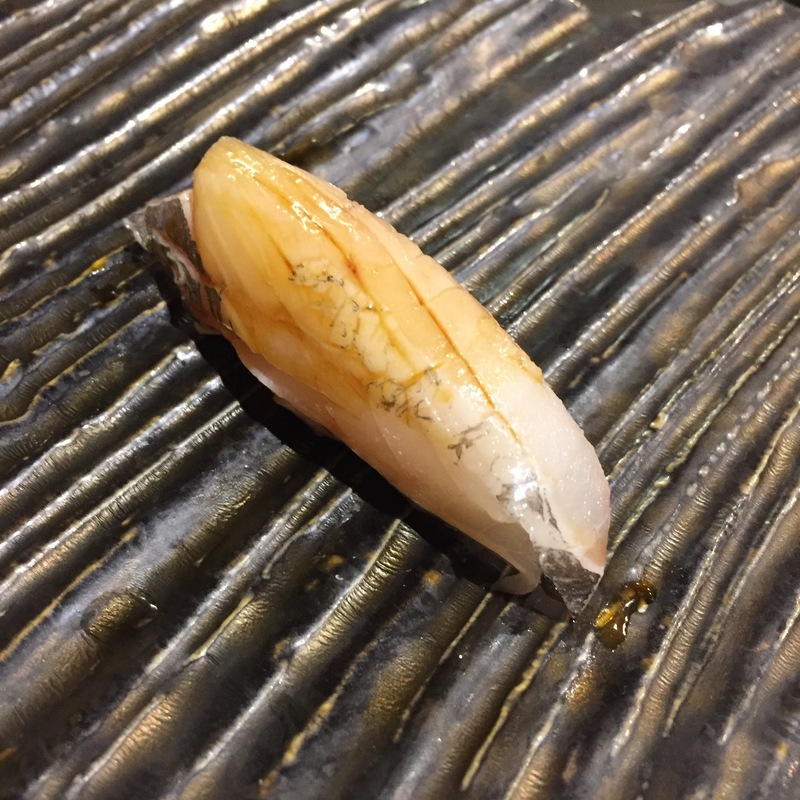 EBO DAI (Butterfish) – I LOVE salt, I am the queen of salt, I have an entire collection of salts at home, and I over-salt everything. Remember that as you read this: This serving was crazy salty! The fish was, as it always is, BLAH. I am not a fan of EBO-DAI, never have been. The serving made it worse. So bad. 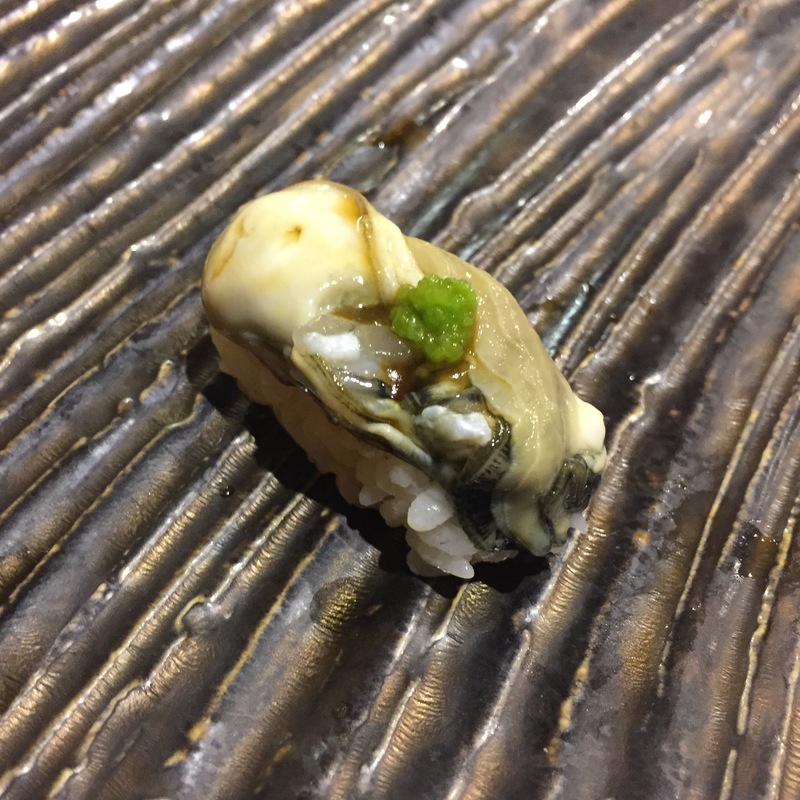 Kumamoto oyster – Good enough, but again, really salty. What’s with that? The appetizer version was WAY better. 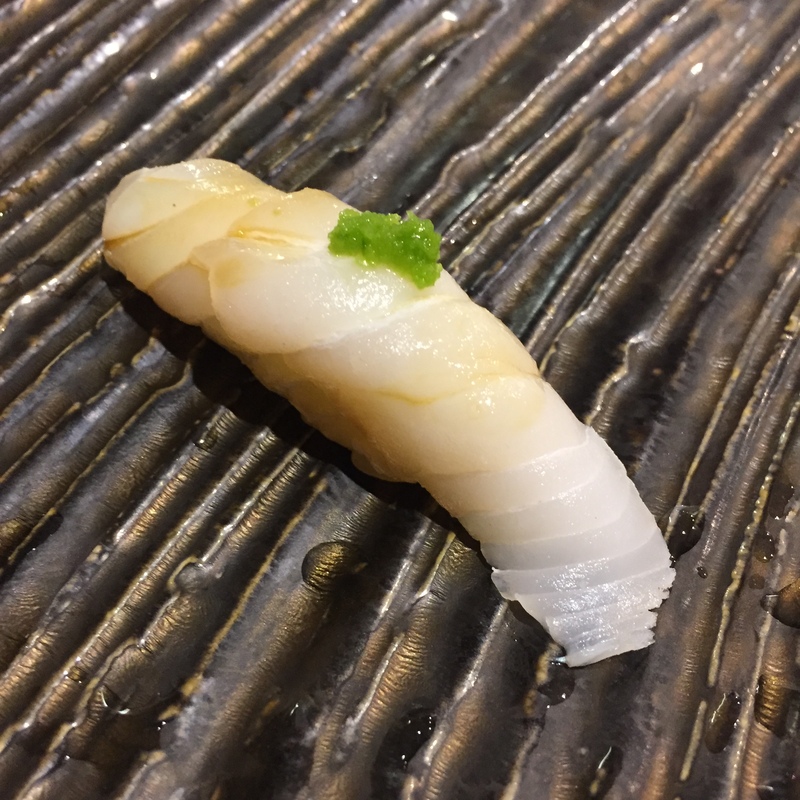 KAIWARI ZUKE (Whitefin Trevally) – Taste just exactly like a SHIMA AJI, it’s the same family, so makes sense, slightly firmer/denser of a fish, but that could also be the number of days aged… I’ll give this a pass. 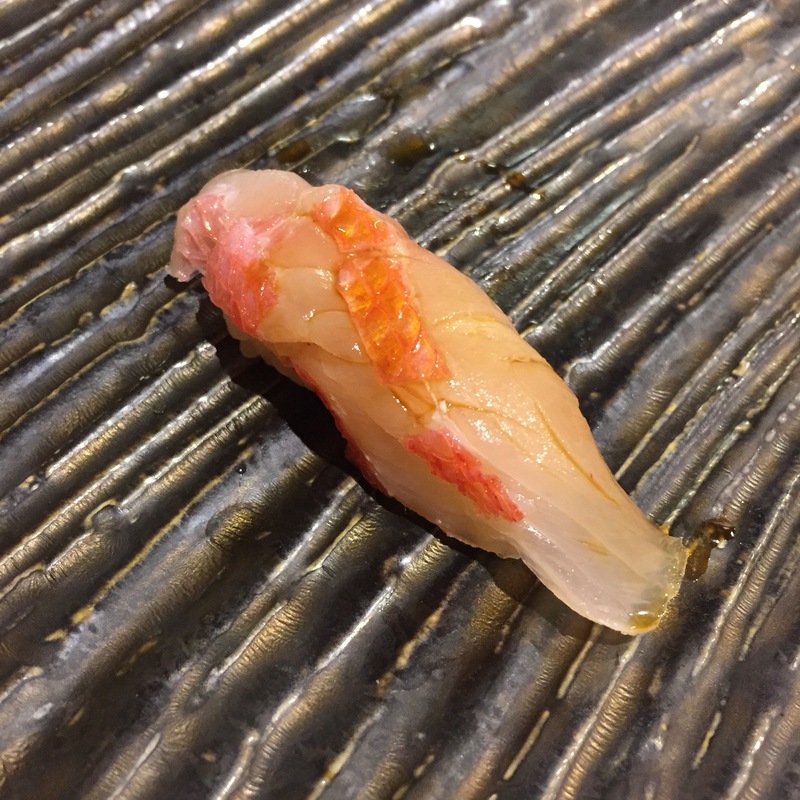 KINMEDAI (Golden eye snapper) – KINMEDAIs are one of my favorite whites. This was good, but I’ve had much, much better KINMEDAI before. 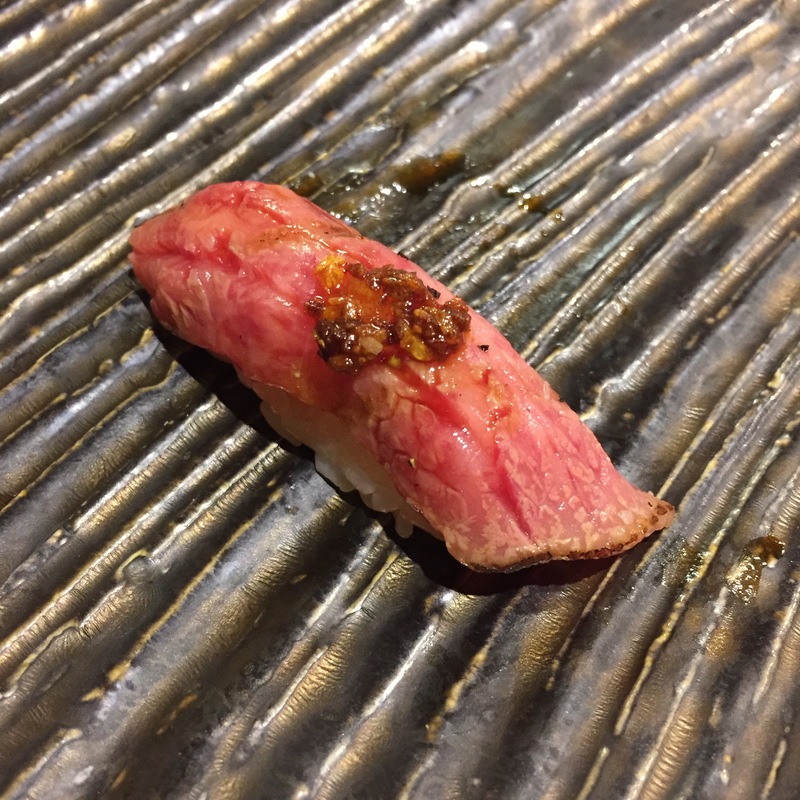 WAGYU served with garlic chips – Holy garlic!!! I loved this! And I am not even a fan of seared Waygu! Again, not sure the reasoning behind when to put the dressings (garlic chips or otherwise) atop or beneath the fish. 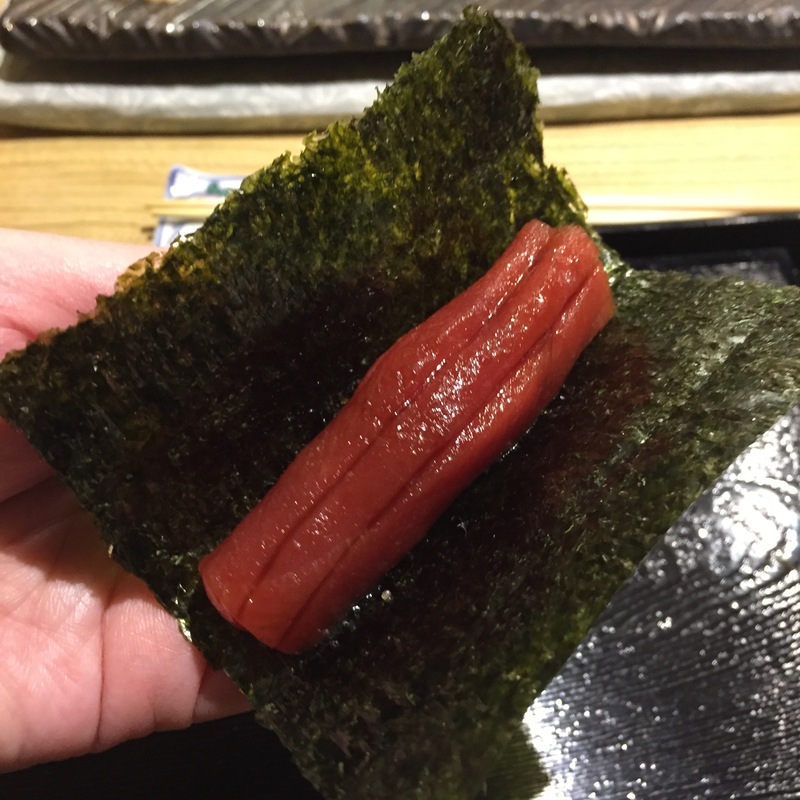 CHUTORO (Medium fatty Tuna) – Dressed with a little grated ginger atop, and served Ichimura style (layers of thinly sliced TORO). Yumm!!! Of the three times we’ve been to Cagen, this is the first time he’s served TOROs Ichimura style! 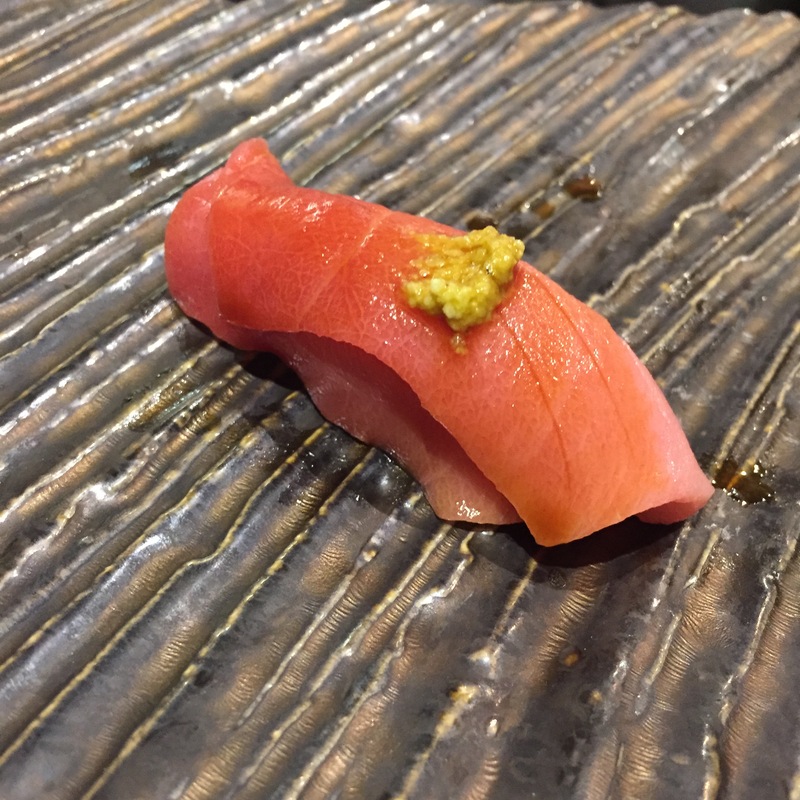 AKAMI ZUKE (Marinated lean Bluefin tuna) – Too many chefs are claiming ZUKE, and not actually ZUKE-ing. This was very good! Scrumptious! 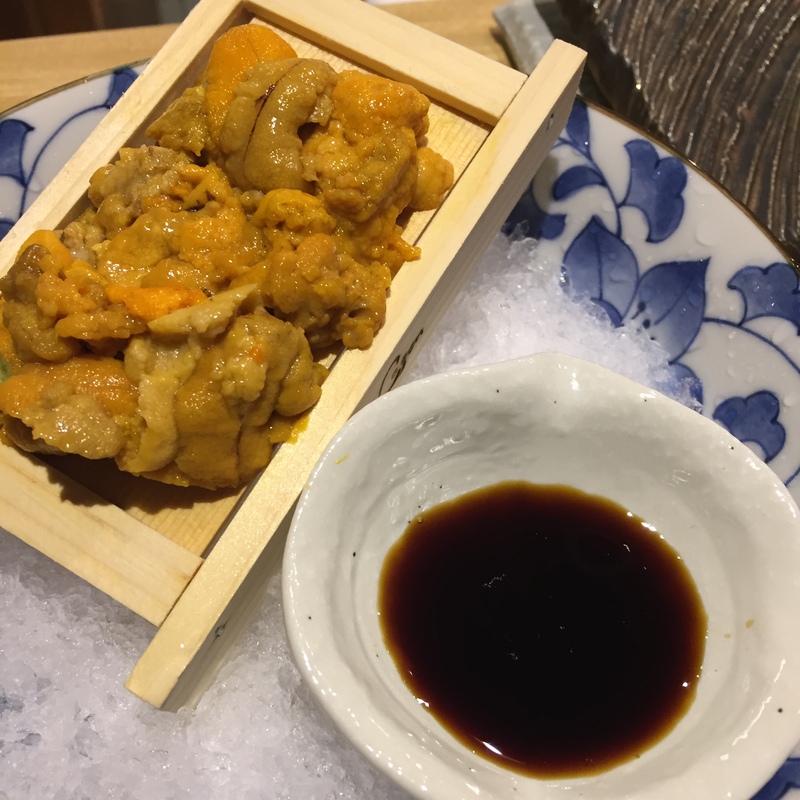 UNI from Hokkaido – Significant improvement from the Mexican UNI appetizer, but still quite a disappointment. These days, a decent UNI is a dime a dozen. 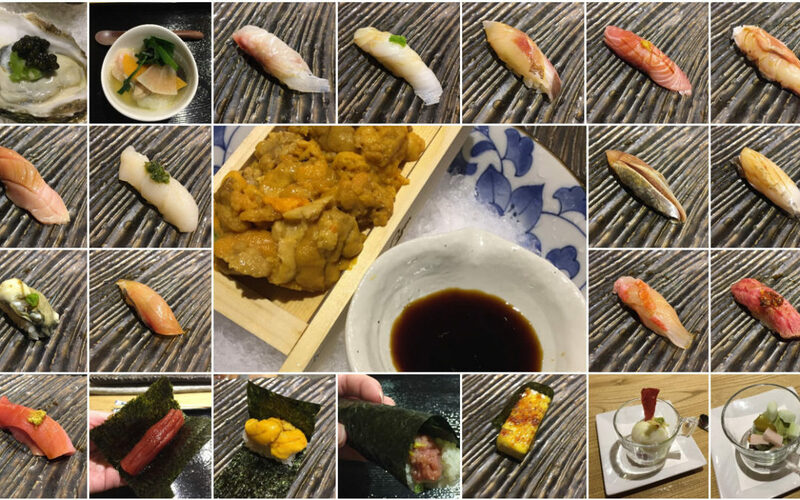 For a Michelin rated sushi-ya to have such a pitiful UNI is tragic. 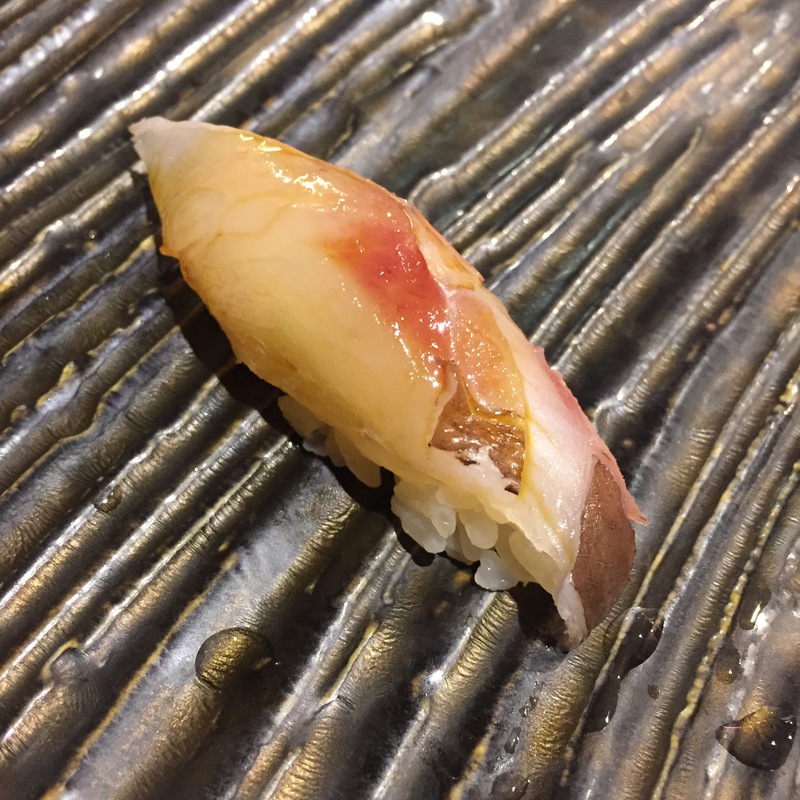 NODOGURO (Black throat) – So sorry I missed the photo (this one is from an July Cagen post, which was MUCH better). The unfortunate truth was that it was over seared. 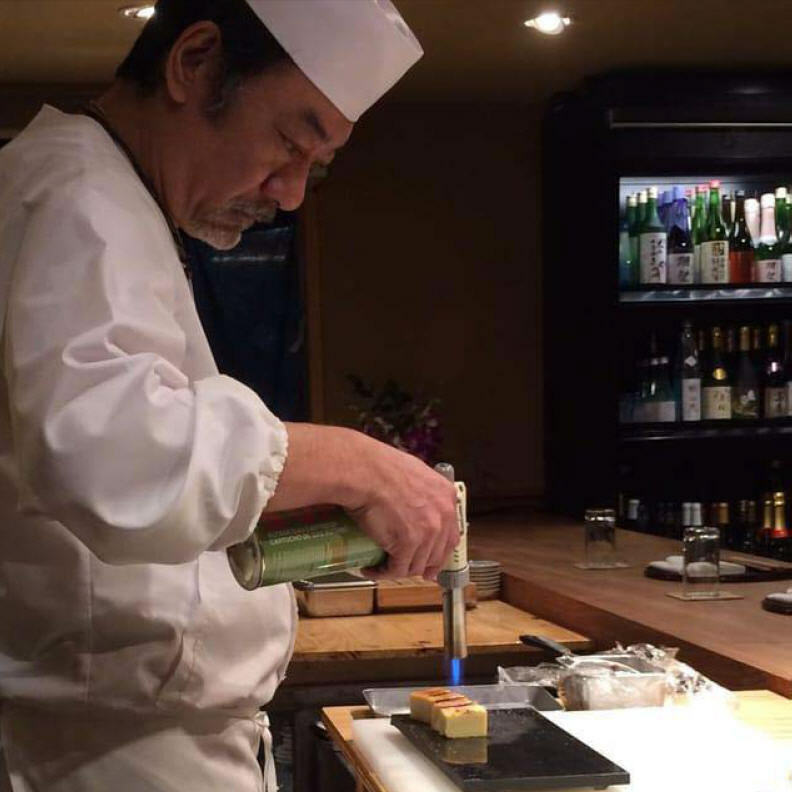 Tomita-san likes to sear his fish on the grill rather than with a torch. This one was practically cooked throughout. 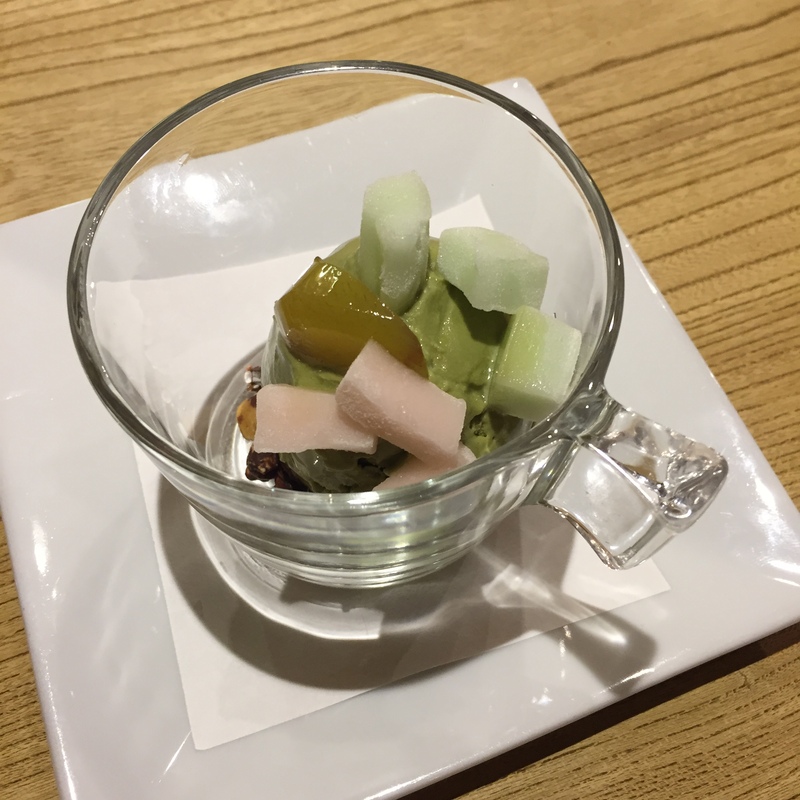 Good, but really not a fan of cooked foods during my sushi omakase. 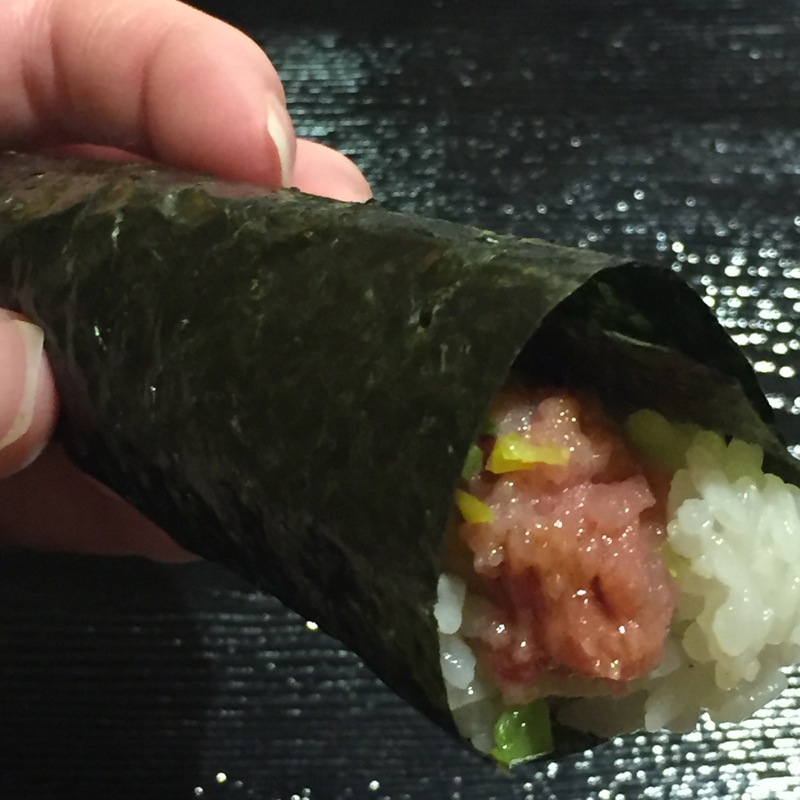 TORO TAKUAN Handroll (chopped TORO with TAKUAN) – Much appreciate this over the NEGITORO. Very good.